Customer Review: Carbonite online back up service is very slow. My review on Carbonite online back up service. 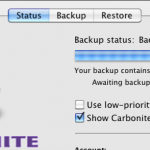 I do not recommend Carbonite as a back up option if you have a lot of files. Well if your thinking about getting an account with Carbonite for your online back up service there are some things you should be aware of. I purchased Carbonite on November 6th 2009 and I have yet to be able to back up all of my files. Now I know that uploading files can be a slow process depending on the amount of file you are uploading as well as your internet speed connection, but it has been eight months now and I am not even half way through, so I decided to change my back up preferences and upload my most important files first which would be my photos them home videos etc. Well this did reduce the amount of files I am trying to back up from a little over 500 gb to 40.37 gb so I figured this should take a few days. I am on day 2 on the back up process and will update this post when this is finally done. Now remember I still have over 480 gb worth of files I still need to back up and I am almost up on my one years subscription, so hopefully if this is done before the year is up then I might resubscribe otherwise this was a waste of my money. I guess a good way to look at it is I paid $54.95 to start the process of backing up my files the downside is if my files become corrupt or damaged I might not be able to restore them, because they have never been backed up. I hope this helps if someone is considering purchasing a carbonite account and has a lot of files at least they will have an incite on what to expect. I work on a Mac and recommend using apples time machine as a fast and easy back up solution I am not familiar with windows pc back up solutions so if you have a recommendation please post it below or if you know of a better online back up solution that you have tried please post it here to share with others. One more thing if you have used Carbonite and have had a negative experience such as the same type of issues I have had or if you have had a positive experience with carbonite please post it below. After spending my money on the Carbonite subscription service, and never achieving a full back up I recommend just buying an external hard drive as a reliable and fast backup system.